Hi there and welcome all to my online portfolio. 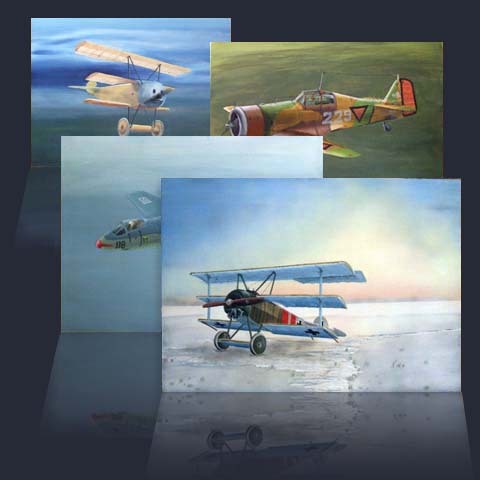 My principal web site is Let Let Let Warplanes and this is web place focused in the aviation modeling, history, art… this web site is my attempt to express my self more in the way of the artist. Most of the art I have made is digital 2D art but I also make classic oil painting. So what is going on now? Just some time ago I have released full artwork material for the new book which is in the moment in the process of preparation for print and I hope that in few weeks you will be in detail informed here about this release. In the meantime hope you will enjoy here. In future I will make many interesting add here and maybe some details and working technique. Huge of my art work today present digital 2D art. But long time ago thing was much different. In the late â€™80 and early â€™90 computer was still much far away from the world of art and classic art method was only party in town. Much was depend of the skill of the artist and much of material and different instruments are used. In that time I have work number of monochrome raster arts and for this purpose I have used well know â€œLetrasetâ€ self adhesive foils. Basic drawings are prepared in pen or technical pen and two leading names was and still are â€œRotringâ€ and â€œStaedlerâ€, both from Germany. Important point in my art life was friendship with Tomic Dejan- Toma. From this nice man I have chance to learn much of the technique related to the design, color and paint. He was extraordinary designer and amazing painter. But my first color art was total failure but the next was good. For long time I have used tempera for art. Most of my art find its destination to the other owners and just few of them I have keep with me. From the 2007 I have changed technique and start work with oil paints. Experiences are very good and I plane to stay on this course for a long time. I did not see my teacher and friend Toma for a long time but I hope and wish that he is happy and fine when ever is he now. Very soon after I have start with some serous graphic practice I have a chance to make some of the first public steps. In the late of 1992 I have published article with images and drawings in the prestigious Japanese magazine â€œModel Artâ€. Just few years later, in 1995 my works was used in one book. This was historic book made after the serous research, where I was also add my own findings and there is for first time published my color art. Other material inside this book, name â€œKraljevski avioniâ€, include a number of archive images and technical drawings. Last years my work was used in several articles published, as you could see, in the magazineâ€™s in Japan, France, USA, Poland and Germany. For sure more then thousand of my color profiles is published in various magazines as well books and this number counting!! !